The hardest part about cooking for a group is always finding the right side dishes. One thing I’ve learned is that potatoes are always a win. Mashed potatoes, scalloped potatoes and baked potatoes are a delicious options but when you cook for people as much as I do, you want to switch things up every once in a while. That’s where this delicious and simple recipe came from. I was making pork chops in a mushroom gravy with green beans and wanted something on the plate to pop so I bought a 2lb bag of baby potatoes. The trio of flavors had my favorite Yukon gold, red bliss, and Peruvian purple potatoes. Anything purple on a dish is bound to pop so I found my pick. A 2lb bag feeds roughly 5-8 people so it was perfect for my preparation of 5 people with leftovers. This recipe can’t get any easier. I know I’ve said that before but I’ve never been wrong when it comes to how easy a dish is to make. If you can cut a potato in half and toss them in seasoning, you can indeed make this dish with ease. 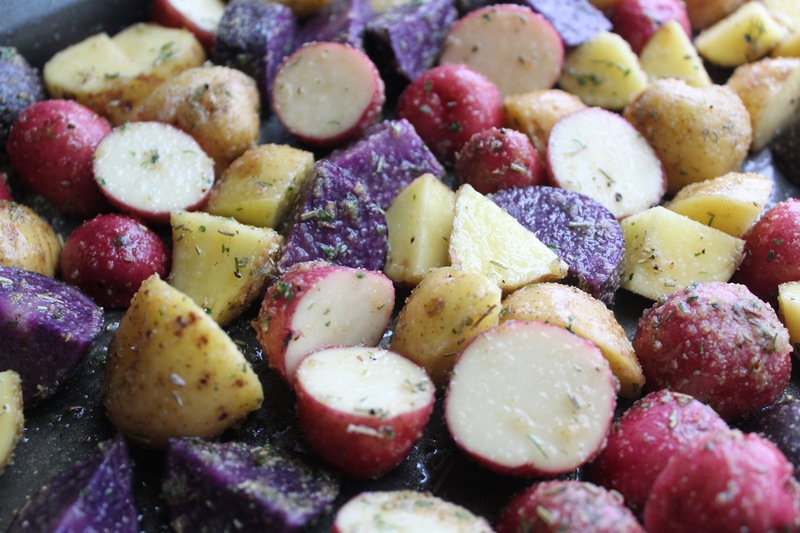 Spread your potatoes evenly on lined or nonstick baking pan and roast for 25-27 minutes or until tender.